Hanoi (VNA) - The Vietnam Drama Theatre is touring Europe to present a comedy criticising egotism. The troupe, led by theatre director Nguyen The Vinh, said they are happy to perform for the Vietnamese expatriate communities in Europe. They will perform in the Czech Republic, Germany, Poland, Austria, Hungary, Russia and Ukraine from now to September 4. 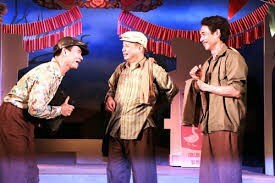 Directed by People’s Artist Tuan Hai, the comedy Benh Si (Egotism) is one of the most famous plays written by late playwright Luu Quang Vu. It stars actors Xuan Bac, Phu Don, Viet Thang and actress Ho Lien. Taking place in a rural village in the north, the play is about a commune chairman and his officers, who are ordinary and good-natured people. However, they begin to consider themselves ‘noble’, and start to seek glory. Ridiculousness occurs happen when the officials’ good natures cannot change to adapt to their new lives. Luu Quang Vu wrote more than 50 plays. Most of them criticise the dark side of society, especially focusing on corruption and authoritarian behaviour. The play Benh Si was Vu’s last production before he died aged 40 in a traffic accident in 1988. It has been performed throughout the country and received great acclaim from audiences, said director Vinh. The artists want to honour Vu’s talent and his contributions to Vietnamese drama, as well as to provide audiences abroad the opportunity to enjoy the drama. Vinh said he expected that the play will help overseas Vietnamese feel close to home.